Is Nad’s Nose Wax safe to use? How long will the nose hair take to grow back? Nad’s Nose Wax is specially formulated to harden and stick to the Nad’s SafeTip™ applicator as well as to the hair around the edge of the nostril. The hardened wax will be removed from the nose with the applicator when it is pulled out. It is important to follow the correct wax setting times detailed in the instruction leaflet to ensure the wax has set properly to prevent any residue from remaining in the nostril. Are the Bikini shape stickers reusable? No, they can only be used once. Can I re-use Nad's Wax Strips? Yes! Re-use a Nad's Wax Strip by simply folding the strip in half so that the wax is on the inside. Massage the strip with your fingers, slowly separate the strip and continue waxing. Repeat this process until the strip is no longer effective. NOTE: Waxing your face? It's important NOT to wax the same area twice as repeated waxing of this delicate area can cause irritation. Always follow the instructions to prepare the skin and wax strips before you commence waxing to ensure you remove as much hair as possible with one treatment. No. The Nad’s SafeTip™ applicator is designed for single-use only. The SafeTip™ end of the applicator is to be used once inside the nose to remove nose hair and the Spatula end of the applicator is to be used once on the surface of the nose to remove hair growing on the surface of the nose..
How many uses can I get out of the Nad’s Nose Wax? Each Nad’s Nose Wax comes with enough wax and applicators to perform two complete treatments. How many uses do you get out of jar? I did not get the expected shape. What do I do? Did you try one of the more complicated shapes (Bermuda Triangle, Heart Breaker, Thunder Struck)? If so, you may need to have a go at the Landing Strip first to gain some more experience. It is also always a good idea to enlist some help, especially if you are not an experienced waxer. I have noticed that there are acids in Ingrow Solution, won’t they be harmful to my skin? There are very low levels of acids in Ingrow Solution which are not harmful to the skin*. These are included in the formula to gently remove the buildup of dead skin that prevents new hair from growing through the skin, which can cause ingrown hairs. *We recommend patch testing before applying Ingrow Solution to the skin. See the pack for instructions on how to perform a patch test. No hair came off when I used the wax. Why has this happened? You use the Nad’s Soothing & Finishing oil wipes before using the wax. The area was not clean, dry and oil-free. Your skin was not held taut. You did not pull off in the opposite direction of hair growth. If you slowly pulled or dragged the wax off. If your hair was shorter than 3mm. The wax will not grip onto shorter hair. The bikini shape did not adhere properly/stay in place, what went wrong? The shapes will not adhere if your skin in not oil free and dry. Your hair must be 3mm long to allow the shape to adhere. You need to hold the shape in place while you apply the wax. It is also always a good idea to enlist some help when using shapes, especially if you are not an experienced waxer. The gel is thick and hard to spread - is this normal? In order for the Facial Wand Eyebrow Shaper to work well on the face it needs to be a fairly thick consistency. The gel itself also adapts to the surrounding temperature so you may find it will thicken in the colder months. The gel will soften by rubbing the Wand between your hands for 30 seconds. Alternatively, place the Wand in a cup of hot water for 2 minutes, tip facing upwards, water level no higher than the ® symbol. Subsequently apply the gel slowly to the area you wish to treat and it will melt with your body heat as it goes on. Important - DO NOT place the wand in the microwave. What are the spatulas for? The spatulas and precision shaping stick can be used for precision application of the hard wax close to the bikini shape and for finishing touches after removing the shape. What areas of the body can I use Brazilian and Bikini Wax on? Brazilian and Bikini Wax is suitable for areas with thicker, coarser unwanted hair like the bikini area and underarms. For legs and arms, we recommend you use one of our other hair removal products: Nad’s Body Wax Strips, Nad’s Natural Hair Removal Gel, Nad’s Warm Wax, or Nad's Hair Removal Crème. For the face we recommend removing unwanted hair with Nad’s Facial Wand Eyebrow Shaper or Nad’s Facial Hair Removal Strips. Baby oil will help remove any accidental wax application, or you may need to trim away hair caught up in ‘misplaced’ wax. If it’s simply post-wax residue or a very small amount of wax, the Nad’s Post Wax Calming Oil Wipes included will be sufficient. What is in the Nad’s Facial Wand? The Nad’s Facial Wand contains the Nad’s Natural Hair Removal Gel in a streamline applicator. Head of Nad’s R&D, Nadine Ismiel-Nash created this bestselling product using the Natural Gel that her mother, Sue, created way back in 1992. 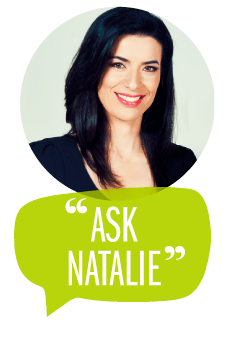 What is Nad's Nose Wax? Nad’s Nose Wax is a specially formulated hard wax that effectively removes visible nose hair from the nostril area. The unique formula can also be used to remove hair from the surface of the nose. You should start working your way from the outside inwards. So start with your bikini line and then work inwards.